Here it is, the long awaited… questions and comments are welcome. Please note edit at the bottom, or, even better, go to my new blog location for the edited pattern; look under the “crafty” tab at the top. Place eyes, nose and mouth and stuff firmly around round 9 or 10. Fasten off and drawstring closed. Fasten off with sl st, leaving a tail for sewing. 3 invdec, sc 5 hdc, sc, finish with sl st, leave tail for sewing on. Fasten off with sl st, leave tail (ha!) for sewing. Nestle the ball of the head into the hole of the body (after stuffing firmly) and sew together. Sew on legs, ears and tail. EDIT: Itsybitsyspidercrochet was kind enough to post some errata for this pattern; find it here. 29 Responses to "worsted Gumball the Kitten pattern (v.2)"
Gumball is gorgeous. I am not very good at crochet (knitting is more my thing), but he (or she?) inspires me. I have a black cat called Seth, and I would love a miniature version of him to take to work. I made mine for a doll’s pet with baby yarn and thread. Thought you might want to see. 🙂 I had to adjust a couple things a bit because of the smaller yarn but not much! I clicked on the link and it said the page could not be found. (5invdec + 1). I was wondering if you could explain that to me, I realize I need to decrease by 12 but the 5invdec is confusing me, I’ve never seen that used before. She made a mistype. It is supposed to be (5incdec+1). V is next to C. She hit that by accident. I love this pattern but I don’t understand how to make the ears. Oh, I think I figured it out. The ears look good, so I hope that’s it. This is the cutest pattern. My son is going to love it. Thank you so much! just finished him last night – my daughter’s third grade classmate has been out sick for over two weeks, so we thought Gumball might cheer her up – we will deliver him this afternoon with some Christmas cookies and books to read. Of course – now my daughter thinks he is so cute, she wants one for all her friends and herself too. She insisted Gumball sleep on her bedside table last night. I guess I need to get crocheting!! Red Heart supersaver yarm, F hook and your adorable pattern. I just made the tail a bit longer and stuffed it to stand up. Thanks so much for an awesome pattern! Adorable!I’m going to get the yarn and hook and start right away! Ok, so i’m still having problems with round 9. I’ve been sitting here for two days trying to figure out how to do it. i even looked at the pattern for the other yarn(which has a difference with round 9). I’ve looked at the tutorial and figured out how to do the invdec. but every way i try to do this round i end up not with 18 stiches. Is there anyway that you could break it down a bit better? i’m so confused and it’s driving me crazy! Gumball is really cute and i’d love to have one to call my own. Thanks! I’ve been having the same problem as Allie. I dont end up with 18 stitches. 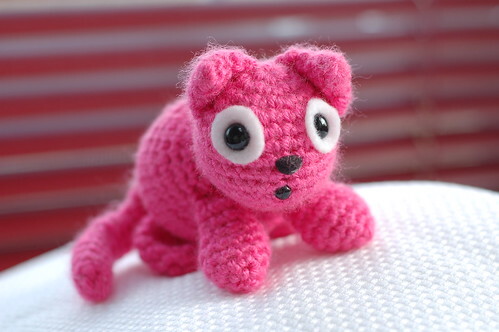 I want to make this adorable little kitty, but im going batty trying to figure out row #9! I am having the same problem I cannot figure out row #9. I really want to make this kitten , but I am confused. Okay, apparently people are having trouble with row #9 of the head. The main point of it is that you’re going, in one row, from 30 stitches to 18 stitches. If you were going down to 15, that would be decreasing every stitch. But it’s a little less, so basically you want to throw in six regular single crochets, evenly around. In other words, for this round you’re doing a whole lot more decreases than regular stitches. But really, as long as you have the beginning of your round marked, just put the single crochets wherever (even, gasp, all right next to one another) – just make sure you end with 18 stitches total. I have made the head, body, front legs, tail… BUT I have questions on making the back legs and ears… they don’t follow the same format as the other parts. – Back legs, step 6: I don’t know what to do with sc 5 hdc. Do I do this in one stitch? Or go around? can you spell it out for me please? How many stitches in final row? hope my questions make sense! 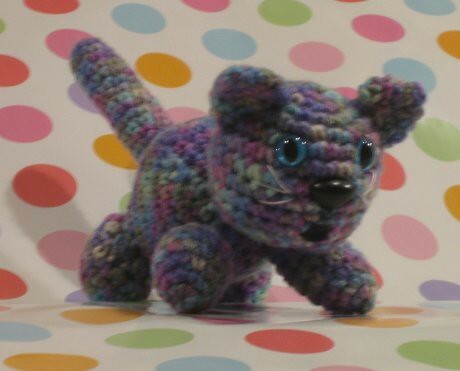 Love the pattern… can’t wait to have a finished Gumball Kitten!! THANKS! Cute!! I have to make a Gumball now! Thanks for the pattern! Hi i love this pattern! Is it ok if I sell the finished product?